Demons are a species of evil creatures coming originally from the HFIL, or Hell if you'd like to call it like that. The demons specialize each in their own Ki signature and have an evil aura around them forever. Most demons also tend to use weapons when strong enough to master the more complicated fighting style. They're a feared race and are rivals to the Kais. 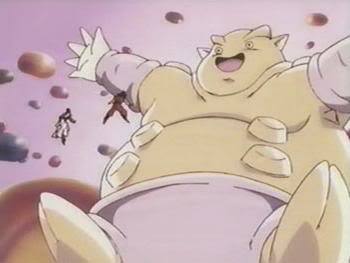 The race's leader is the feared King Dabura. Baby Form: Ironically, this is a rather powerful form. 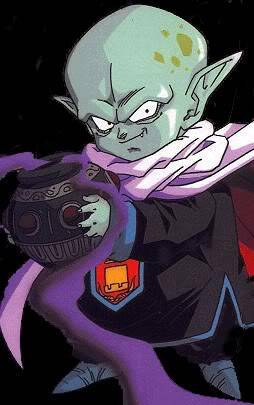 When reaching this form your body will shrink to midget sizes but your Ki will increase vastly. Learning to use this form will take a very short time. Bulk Form: Your body will grow to humongous sizes and your skin will get darker as well. Pumped muscles are shown from your entire body noting the great strength. Giant Form: Aside for your slightly better attitude towards most persons and unawareness of what's surrounding you, your body's proportions have grown immensely and several extras have been added to your body's extensions. Side Note: For self-awareness during this form you will have to create an RP topic of how you transform and still maintain self consciousness. Must be approved by Staff. Lord Form: Horns will grow out of your head if you still didn't get any. Your body's color gets redder and you're affiliated with the fire element. Your size will also shrink back to normal proportions from your latest form. Great Demon Lords have been known to take this form. Upon defeating an opponent, a Demon can infect them with a 'Majin' status if they are of bad-natured. That opponent will not die and gain a stat boost of x2 Power Level and Ki and will permanently get to their most powerful form achievable, but they will remain the caster's servants forever. When they die their soul is eaten by their lord and the gains they gained in this form is transferred to their master (x0.1 the total gains without including bonuses). Limit to 4 Majin servants per Demon. Cannot inflict on Androids or Kais.